Have you ever written a secret message in code? If not, this is a great place to start. Codes are a fun way to send messages to your friends in a way that ensures that the wrong person won’t read it. But did you know that in real life, secret code writing, or cryptography, has given both rise and fall to nations for thousands of years? The first examples we have of cryptography (the art of writing messages in code) dates back to 1500 BCE. The Greeks used a clever form of cryptography to send a message to the Spartan General Lysander to warn him that the Persians were mounting another attack. Thanks to this clever warning, Lysander readied his troops and held off the invading Persians. Encoded messages have been used by by armies, kings, queens, emperors, treasure hunters, bandits, and normal people with a secret that they don’t want to be revealed. Did you know that one of the most commonly used ciphers of all time was created by Julius Caesar and is known as a Caesar Cipher? Julius Caesar was the emperor of Rome from the years 100 BCE to 44 BCE. He was known as a great leader, an exceptional public speaker, and brilliant military strategist. His military conquests of neighboring nations turned the Roman Republic into the powerful Roman Empire. 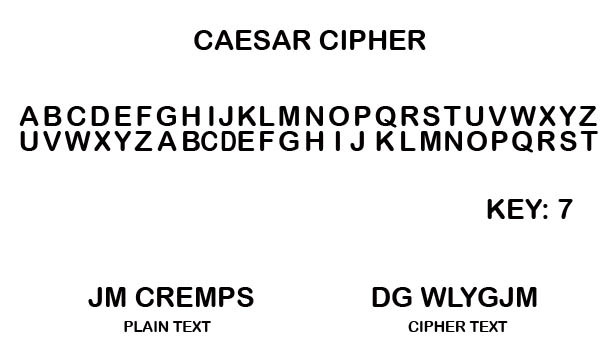 Caesar’s cipher gave the Romans a military advantage that their enemies lacked. In today’s age of computer systems, Caesars code may seem simple, but it is a great way to get your code-writing skills up to speed. Step 1. Write the standard alphabet in a line on your paper. Write down the alphabet in a line on your paper. This is known as the Standard Alphabet. Step 2. Choose your Key. Our Key is 7. Count over 7 letters from the letter A, and begin your Substitution Alphabet below the 7th letter. Now write the letter A directly beneath the letter G. This will be known as your Substitution Alphabet line. Now go back to the beginning of the alphabet and write the next letter in your Substitution Alphabet directly under the letter A in the Standard alphabet. Continue filling out the rest of the alphabet. Now you are ready to begin encrypting your message! Step 3. Finish filling in your Substitution Alphabet and you can now use your secret code! To encrypt your message, simply locate the real letters of your word on the Standard Alphabet line and substitute the letter directly below it from your Substitution Alphabet Line. Continue working through your message substituting the real letters with the letters from your cipher.